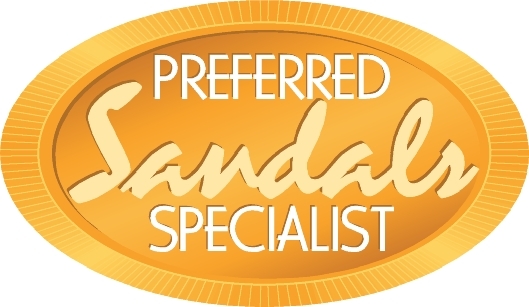 Vincent Vacations is a Preferred Sandals Specialist! Vincent Vacations is a Certified Sandals Specialist! With so many resorts, it's difficult to know which Sandals to choose. We have each location mentioned below. Check out the areas of our web site on other resorts in the Sandals family, Beaches Resorts and Grand Pineapple. Sandals is the ultimate all-inclusive, luxury included vacation. No words will ever fully capture the Caribbean's celebrated beauty and distinct essence. Its splended beaches, gracious people and easygoing vibe must be experienced first-hand. Each Sandals location has much to offer. From a tropical beachfront oasis - your own relaxing sanctuary with pristine shoreline, towering coconut palm trees, captivating panoramic ocean views and inviting waters, no one can beat Sandals Resorts. Check out our Sandals Posts on our Site! We have a description of each Sandals Resort below, Sandals Resort locations, features, personality/mood and a description. Links to reviews can be found in the description. Be on the look out for the newest Sandals resort in Playa Del Carmen, Mexico. Not to mention the first overwater bungalows in the Caribbean opening in the fall of 2016 at Sandals Royal Caribbean in Jamaica. If you like fantasy honeymoon suites, like on The Bachelor, private plunge pools, romeo-and-juliet suites, the best honeymoon resort with private pools room, Sandals is a great option - give us a call! We hear, "what honeymoon destinations all inclusive" is the best, and no one beats Sandals! Situated on the pristine white sands of Dover Beach. Largest River Pool in the Caribbean. View our Sandals Barbados trip review on our travel blog. The real Jamaican experience. Close to the Montego Bay 'Hip Strip', the tourism mecca of Jamaica. Greg Norman Designed Golf Course. Exuma's best powdery white sand beaches with a panoramic view of Emerald Bay. Situated on the most beautiful and longest white-sand beach in Antigua, Dickenson Bay. Surrounded by the warm Caribbean Sea. Pigeon Island, home to our annual St. Lucia Jazz Festival, combines historic British & French flavor that unfolds at Sandals. This resort has been picked by Sandals own BDM, Gerald McKitty, as his favorite Sandals location for views and vistas. Hidden inside the naturally beautiful landscape of Saint Lucia lies a secret garden filled with effervescent flowers, luscious palms and serene waters. located in the South Eastern Caribbean. The island is volcanic with some black sand beaches. There are rainforests, a great array of sightseeing and tour options. Read more about our review of Sandals LaSource Grenada. Minutes south of the capital, lies this exotic piece of paradise. Nestled in one of the most historic parts of Castries. Situated in the secluded setting of a 220 acre tropical estate with its own 9-hole golf course sloping down the hillside to a magnificent golden beach. Jamaica - Boasts the largest private white sand beach on the North Coast. Located in Jamaica's Main Tourism Hub three miles east of Montego Bay. Jamaica - On Negril's famous 7-mile beach on the North West Coast of Jamaica. Set amongst lush palm groves, powdery white sand beach and the calm aquamarine Caribbean Sea, a must for Scuba and Snorkel enthusiasts. Jamaica - The true Garden of Eden, Sandals Ochi Beach Resort, the largest Sandals Resort, is situated on the slopes of over 100 acres of beautiful hillside gardens overlooking the Caribbean Sea. Delivers leisure in an oasis of 'old world charm' and understated elegance. This elegantly appointed resort looks out upon the crystal clear turquoise blue water of the Bahamas. Jamaica's only Resort with a private offshore Island. Georgian-style Great House setting hosts the gracious British traditions of a bygone era. Jamaica - Caribbean's only Champagne and Caviar Bar. All Suites are serviced by Butlers trained by the Guild Of Professional English Butlers. Jamaica - Noble escape in a European-style beachfront village setting. This resort is truly 'the jewel on the southcoast'.